Christmas traditions in Australia and New Zealand have many similarities to British and United States traditions, including traditional Christmas symbols featuring winter iconography. This means a red fur-coated Santa Claus riding a sleigh, carols such as Jingle Bells, and various snow-covered Christmas scenes on Christmas cards and decorations. However, the timing of Christmas occurring during the Southern Hemisphere's summer season has resulted in the development of some local traditions as a result of the warmer weather. The traditional Christmas tree is central to Christmas decorations and strings of lights and tinsel are standard. Decorations appear in stores and on streets starting in November, and are commonplace by early December. Many homeowners decorate the exterior of their houses. Displays range from the modest to elaborate, sometimes with hundreds of lights and decorations depicting seasonal motifs such as Christmas trees, Santa Claus, reindeer, or nativity scenes. Particular regions have a tradition for elaborate displays, and attract a great amount of pedestrian and vehicular traffic during the Christmas season. This is despite the longer days, resulting in dusk occurring as late as 9.00 p.m. in the southern latitudes. Most workplaces conduct a "Christmas Party" some time during December, but rarely on Christmas Eve itself. As many people take their holidays between Christmas and New Year's Day, and many workplaces completely close for that period, these parties are effectively an end of year or break-up party and frequently feature little or no reference to Christmas itself. Likewise, schools, TAFE (vocational training), and universities break for summer holidays. Schools typically end in the week before Christmas, to recommence in late January or early February. Following Christmas, many churches will change their evening meetings to a less formal format, while many hobby clubs also suspend or alter their meetings in this period. On Christmas Eve, the children are told, Santa Claus visits houses placing presents for children under the Christmas tree or in stockings or sacks which are usually hung by a fireplace. In recent decades many new apartments and homes have been built without traditional combustion fireplaces, however with some innovation the tradition persists. Snacks and beverages (including liquor) may be left out for Santa to consume during his visit. The gifts are opened the next morning, on Christmas Day. Families traditionally gather for a Christmas Day lunch similar to the Anglo-Celtic traditions that include decorated hams, roast turkey, roast chicken, salads and roast vegetables. Christmas crackers are pulled before eating. More recently, as appropriate to the often hotter weather of the day, it has become increasingly popular to serve local seasonal produce such as cold meats, seafood and salad. Similarly, dessert also includes a mix of traditional winter Christmas food (such as plum pudding with brandy butter, fruit mince pies, and trifle) alongside local traditions such as pavlova, a New Zealand dessert popular in both countries, and fresh fruit such as berries and kiwifruit. Candy canes are a popular confectionery in Australia for the children's table in the Christmas period. As Christmas falls in summer, the watching of television is not a strong part of Australian or New Zealand Christmas traditions, unlike in the United Kingdom, in which it is one of the most important days for television ratings. Television ratings in Australia are not taken during the summer and schedules are mostly filled with repeats of old programs or previously cancelled shows. Some locally produced programs have a Christmas special, though often it will be shown early December and not on Christmas Day itself. Many television stations rerun old Christmas-themed films in the weeks leading up to and including Christmas Day, such as Miracle on 34th Street, National Lampoon's Christmas Vacation and various film versions of A Christmas Carol. Some Australian songwriters and authors have occasionally depicted Santa in "Australian"-style clothing including an Akubra hat, with warm-weather clothing and thongs, and riding in a ute pulled by kangaroos, (e.g. Six White Boomers by Rolf Harris). There are also a small number of popularly recognised original Australian Christmas songs, including Paul Kelly's How to Make Gravy and Tim Minchin's White Wine in the Sun but these depictions have not replaced mainstream iconography. The tradition of sending Christmas cards is widely practised in Australia. The price of a Christmas postage stamp is lower than that for a standard letter; senders are required to mark the envelope "card only" when using the lower priced stamps. Christmas Day, Boxing Day and New Years Day are national public holidays in Australia (with the exception of South Australia, where Proclamation Day is celebrated on 26 December instead). Two major sporting events traditionally commence on the day after Christmas Day in Australia: the Boxing Day Test cricket test match, and the Sydney to Hobart Yacht Race. A popular tradition celebrated in Adelaide is the Adelaide Christmas Pageant. This parade is the largest of its kind in the world, attracting crowds of over 400,000 people. Begun in 1933, the pageant is staged in early November every year, usually on a Saturday morning, marking the start of the Christmas season. It comprises a procession of floats, bands, clowns, dancing groups, and walking performers, all culminating in the arrival of Santa Claus. At the terminus of the pageant Santa proceeds to the Magic Cave in the David Jones department store where he can be visited by children. Smaller scale pageants are also held in regional centres. South Australia does not have a Boxing Day holiday. Rather, the weekday following Christmas Day being the Proclamation Day holiday. Christmas Eve, from 7:00 pm to midnight is now a Public Holiday. Carols by Candlelight is a tradition that started in Melbourne in 1938 and has since spread around Australia and the world. At the event people gather on Christmas Eve, usually outdoors, to sing carols by candlelight in a large-scale concert style event. The Vision Australia's Carols by Candlelight which takes place at the Sidney Myer Music Bowl in Melbourne on Christmas Eve, is televised nationwide and it has become a tradition for many Australians to watch the performance. Carols in the Domain takes place in Sydney the Saturday before Christmas. Special events for international tourists away from their families are held on Bondi Beach in Sydney. These may involve a turkey barbecue and such humorous stunts as a fake Santa dressed in a Santa suit surfing in to appear to the crowd. Christmas Day and Boxing Day are both statutory holidays in New Zealand. While Boxing Day is a standard statutory holiday, Christmas Day is one of the three-and-a-half days[lower-alpha 1] of the year where all but the most essential businesses and services must close. Many of New Zealand's Christmas traditions are similar to those of Australia in that they are a mix of United Kingdom and North American traditions conducted in summer. New Zealand celebrates Christmas with mainly traditional northern hemisphere winter imagery, mixed with local imagery. The pōhutukawa (Metrosideros excelsa), which produces large crimson flowers in December, is an often used symbol for Christmas in New Zealand, and subsequently the pōhutukawa has become known as the New Zealand Christmas tree. Several Christmas themed parades are held in New Zealand. The most popular is Auckland's Santa Parade down Queen Street. This features numerous floats and marching bands and attracts large crowds every year. It is held late November to accommodate holidaymakers and is seen as the preamble to the later festivities. The Australian tradition of Carols by Candlelight is popular in New Zealand, especially in Auckland and Christchurch, where there is usually a large outdoor carol-singing gathering known as Christmas in the park. No advertising is allowed on New Zealand television or radio on Christmas Day, a rule that also applies on Good Friday and Easter Sunday. 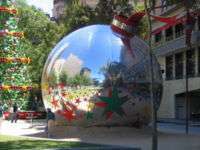 Wikimedia Commons has media related to Christmas in Australia. Wikimedia Commons has media related to Christmas in New Zealand. 1 2 3 "Spreading around the Christmas cheer". The Sydney Morning Herald. 19 December 2014. Retrieved 23 December 2014. ↑ "Sunrise and sunset times for Hobart, Australia in December". Retrieved 24 December 2014. ↑ "Letters from Santa Claus your Kids will love! Santa Claus Letters". SantaMail. Retrieved 22 December 2011. ↑ "Christmas in New Zealand". New Zealand Tourism Guide. Retrieved 24 December 2014. ↑ "Christmas in Australia". The-North-Pole.com. Retrieved 22 December 2011. ↑ Leach, Helen (2008). The Pavlova Story: A Slice of New Zealand's Culinary History. Otago University Press. ISBN 978-1-877372-57-5. ↑ "Where is all the Australian Christmas music?". The Sydney Morning Herald. 22 December 2014. Retrieved 26 December 2014. ↑ "Christmas Stamps". Australia Post. Retrieved 26 December 2014. ↑ "Australian Government – Public Holidays". Retrieved 21 December 2014. ↑ "Carols by Candlelight defines the Aussie Christmas on the couch". The Conversation. 23 December 2014. Retrieved 23 December 2014. ↑ "Pohutukawa trees". Ministry of Culture and Heritage (New Zealand). Retrieved 6 September 2012. ↑ "New Zealand Broadcasting Act 1989". Government of New Zealand. Retrieved 21 December 2014.